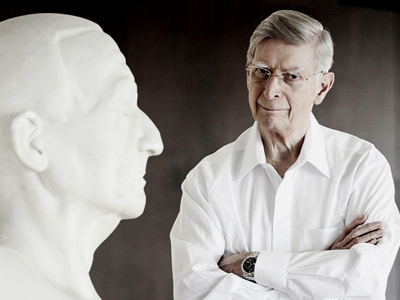 MUNICH — There is a genteel inscrutability about Herbert Blomstedt. Authoritative, tall and silver-haired, he has never cut the profile of a star. But the gaze is probing. Musicians play well for him perhaps out of a sense of being acutely monitored. Two years ago Bayerischer Rundfunk hired the Massachusetts-born, Juilliard-educated Swede, now 85, for a Dvořák Seventh with its flagship Symphonie-Orchester. That was a revelation: the minor-key work played as an engrossing set of assertions and retorts, Victorian shadings and Czech emphases. Much cheered, it soon showed up as a pirate CD. These last two weeks Blomstedt has been back with the BRSO, conducting music associated with him. The Feb. 7 Gasteig program paired Nielsen’s Flute Concerto (1926) with Bruckner’s D-Minor Third Symphony. Henrik Wiese, one of the orchestra’s two principal flutists, nimbly traced the solo line of the stubbornly jaunty two-movement concerto. Its brief sections of banter with other wind instruments injected droll humor. Blomstedt and the modest orchestra, in unobtrusive support, flexed their way through the Danish composer’s background shades of light and dark. The concluding tempo di marcia section, written last and calibrated to sum up the 18-minute piece, made its witty impact without seeming to try. By using the symphony’s Urfassung of 1873, Blomstedt cast the work in optimal light, as a snapshot of a composer in transition. (Christian Thielemann and his Munich Philharmonic did the same in 2009; Lorin Maazel in concerts since then has not.) For Bruckner was just settling on what would become his trademark compositional palette and his way of leading the ear with brass motifs. The piece suffers from odd logic and thematic paucity, especially when compared with the less “Brucknerian” yet fully mature and richly argued C-Minor Second Symphony of the previous year (1872). Numerous revisions to the Third never overcame these problems. The opening trumpet melody over rippling string figures signaled a balanced, restrained performance. Conducting from memory and without visible toil, Blomstedt had apparently set fine dynamic and interpretive details in rehearsal. Wind intonation was exemplary. The Gemäßigt, misterioso first movement, as marked in this version, and the brief Scherzo brought suave playing from the BRSO strings. Blomstedt did not always nudge the pulse in the second-movement Adagio as might his peers in this repertory — fellow octogenarians Stanislaw Skrowaczewski (still busy at 89) and Bernard Haitink (83), along with Thielemann (53) and the versatile Daniel Barenboim (70) — and so Bruckner’s longueurs took their toll, but the conductor’s discipline and his rapport with the musicians compensated. Call it an honest snapshot. This entry was posted on Sunday, February 17th, 2013 at 8:56 am	and is filed under Munich Times. You can follow any responses to this entry through the RSS 2.0 feed. Both comments and pings are currently closed.